Yet God wants us to trust. To trust Him. God is nothing if not trustworthy: He is good. He is faithful. He is for us. Everything He has done has been out of love for us. We can see this even in the extravagance of the world He created and placed us in. Look around. Look at the beauty and the splendor of creation. Look at the majesty presented in the sunrise, in the sunset, and in the stars; the sky is strewn with abundant glory. Look even at the Colorado River flowing with endless whimsy, wonder, and strength. And look at your-self. You are fearfully and wonderfully made, a vessel of the Holy Spirit, the very dwelling place of God, because He loves you and wants to share your life with you every single moment. God is our partner. He is our ally. He is our friend. He is our helper. We can trust Him. And because we can trust Him, we no longer have to live in fear. We can step out in trust, in faith, and live with His strength. Where is He inviting you to trust Him? With your family? With your lack of one? With an adventure, a move, a class, a friendship, a kayak trip? Where is He asking you to step out in faith and go forward not in your own strength but His? In your own healing? In pursuing more of His life for you, in you? Click here to listen to this week's podcast. 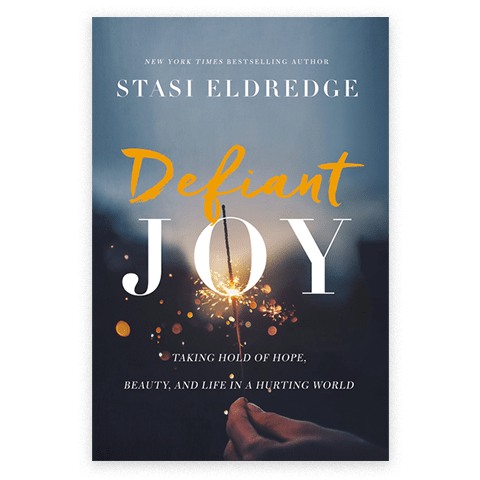 In the conclusion to the four-part series on Stasi's new book, Defiant Joy, you'll discover how to take hold of hope, beauty, and life in the midst of suffering, pain, and loss.